People practice martial arts for different reasons. Whether your aim is to defend yourself or learn self respect, you will come to achieve mastery of self as your practice progresses. Your enhanced focus helps you to tune deeper into your mind and, eventually, into yourself. This is clearly seen in the iconic martial artist Bruce Lee. Bruce Lee did not only amaze people with his prowess in martial arts but also with his spiritual philosophy that ignites the hearts of many. His unwavering dedication to his art, coupled with a commitment to understanding himself, lead him to his path of spiritual awakening. He wrote himself personal letters that documented his journey to self actualization. Each of us may have different answers regarding the question Who Am I. While there is no right answer to this question, our answers vary depending on our personal growth. Bruce Lee may have been more spiritually awakened than most of us when he wrote the following words to himself. “At the moment I’m wondering for whom am I writing this organized mess? I have to say I am writing whatever wants to be written. I have come to the realization that sooner or later what it really amounts to is the bare fact that even an attempt to really write something about one’s self demands, first of all, an honesty towards oneself to be able to take responsibility to be what we actually are. Bruce Lee pointed out the big difference between self actualization and self image actualization. Self actualization is being your true self while self image actualization is the image you want to create based on how you want others to see you. 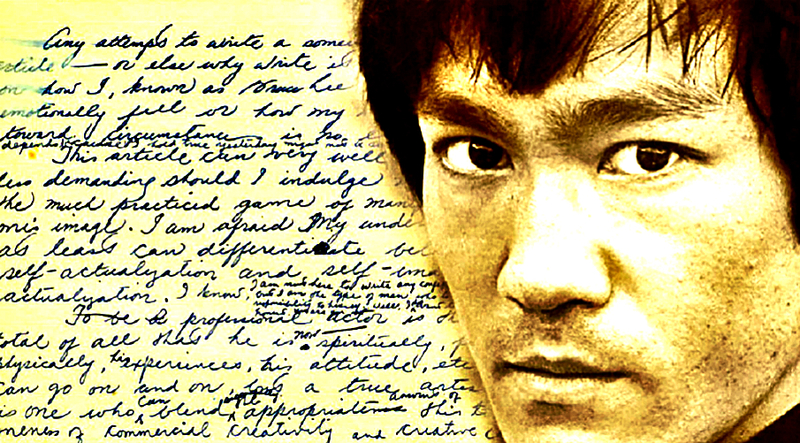 In his journal entry entitled “In My Own Process,” Bruce Lee described life as a process that each one of us goes through. And in this process, one continues to expand and grow until one comes to term with his genuine self and has the courage to be what he is. Bruce Lee seemed to have arrived at a conclusion that ranked him among the world’s greatest philosophers and sages. It’s the final realization that we’re not “having” it but simply “being” it.